When I was installing solar panels on our house I couldn’t decide if there should be a gap between the rows. Leaving the gaps would make space for snow to pile up and cover the top row. With no gap the snow would slide off as one sheet. 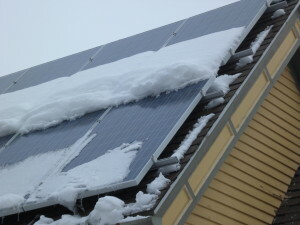 However, in the summer time having a gap would make the panels cooler with more space for hot air to escape. Since there is more sun in the summer time, I opted for a gap to keep the panels cooler. Well I proved one thing, a gap does create snow dams. 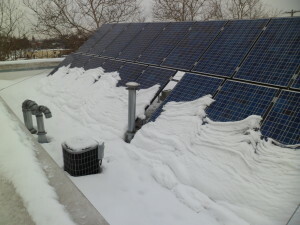 I walked over to the Ypsi Food Coop and looked at their solar panels. Those panels don’t have a gap between the rows and you can see that snow on the top row has completely slid off. 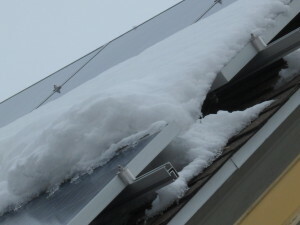 However, they have another problem of not being high enough off the roof so the snow piles up at the bottom of the panels. 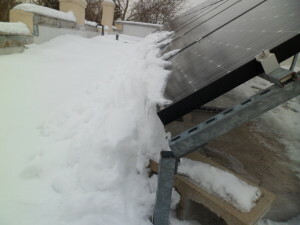 This is not a big deal since these panels are on a flat roof that is easily accessible and a volunteer checks on the panels to shovel the snow away from the bottom of the panels. If the panels were mounted higher, they would have a higher wind load and would need more weight to keep them ballasted to the roof.